Sir Alex Ferguson returns to the dressing room in this coming May's Treble Reunion, and in anticipation of that we take a look back at the historical season. Individuals identifying themselves with Manchester United hold the treble in the highest regard. Fans throughout the world understand how special it is; United were the first side in English football to accomplish such a feat. With the scoreline at 1-1, United were running ragged. They had to work twice as hard against a dynamic Arsenal side due to Roy Keane’s sending off. In the 90th minute, Phil Neville was hopelessly beaten by Marc Overmars; a cynical lunge followed, resulting in a penalty. United were after the treble, but their fiercest rivals the Gunners would gladly dent the chase. Nonetheless, Peter Schmeichel bested Denis Bergkamp from 12 yards to keep the dream alive. What unfolded from thereon was off the script; picking up a loose ball from the halfway line, Ryan Giggs took on Arsenal's elite back line. The dribble and close control had the league's best defence looked like amateurs in an instant. 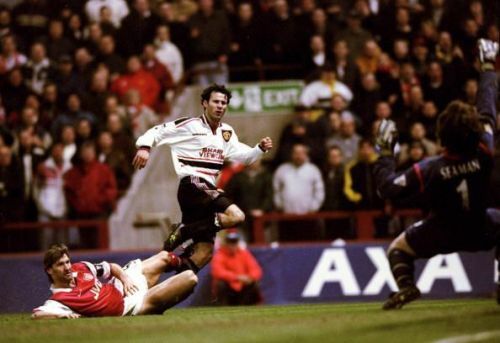 Giggsy proceeded to lash it past Seaman, and the supremacy over Arsenal proved gratifying. Giggs' amazing goal left a bitter taste in every Arsenal follower, including Arsene Wenger. In March 2015, he reflected on the game in an interview "... I think that goal won them the treble because, if Bergkamp scores, I think the game is over. It was a trauma for us in a negative way and for them a positive way. It put them on the road to glory." Manchester United faced a daunting task against a gifted Juventus side comprising the likes of Zidane, Del Piero and Inzaghi. United were also at a disadvantage coming into this match, with Juventus leading on away goals. A fortnight ago in Old Trafford, the Red Devils had Ryan Giggs for inspiration; the Welsh wizard scored in injury time to give United a chance in the return leg. But the tie seemed lost when Flippo Inzaghi put Juventus two goals up before 15 minutes. In moments like these, a player's mental capacity comes to the fore. That night in Turin, Roy Keane's status as a club legend was cemented. The Irishman spearheaded an inspiring performance, his header in the 24th min getting United back. He relentlessly covered acres of space, even as he was booked, which meant missing out in the final. Roy Keane didn't allow that to deter him. Fergie called it "the most emphatic display of selflessness I have seen on a football field..."
Dwight Yorke gained the full advantage for United in the 34th minute. United fought on in the second half, and Andy Cole secured the tie and set the team off to Barcelona. That was the night United believed. ... The atmosphere in Nou Camp was roaring with absolute certainty. United won the ball back from the restart and attacked down the left flank. A corner was given from a deflected cross on Samuel Kuffour. Thunderous roars reverberated from a sea of United faithful, inducing a familiar sensation. Beckham whipped in the ball, and Sheringham headed towards the far post. Many argue that Ole Gunnar Solskjær offered nothing much other than poaching goals during his career. But this moment summed up Solskjær's true value; the ball fell and he was there to finish it. He was at the right place at the right time, in almost Gerd Muller-esque fashion. The Munich air disaster in 1958 broke the team apart, but Manchester United rose from the ashes and became one of the biggest football clubs in the world. The crest underlines sheer grit, determination and belief, and it is not for the faint-hearted to bear. 1999 was a fitting way to cap their success. United won the treble in a way they know best.